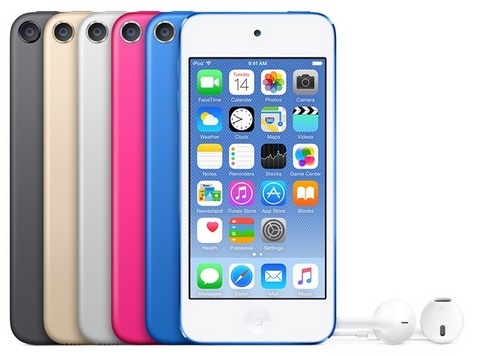 Apple has released hardware updates to the iPod line, with iPod Touch receiving improved hardware specifications and new colors, and iPod Nano and iPod Shuffle receiving new color options. The revised 6th generation iPod touch specifications mean the device is much faster, as hardware is now closely in line with that of iPhone 6 models, with the notable difference of having a 4″ Retina display, and unlike iPhone, no cellular connection capabilities. Pricing for the revamped iPod touch starts at $199 for 16GB and goes up depending on storage capacity, to $249 for 32GB, $299 for 64GB, and $399 for the 128GB model. Separately, Apple released updated iPod Nano and iPod Shuffle hardware which feature new color options, but otherwise no change in hardware or software. Prices for those devices start at $49 and $149, but given the dramatically more significant features available to iPod Touch, it would generally be recommended to spend the extra $50 for the revised iPod Touch to get a more powerful device. I assume 6g iPod Touchy also has 1GB of RAM like the current iPhone 6 and iPhone 6 Plus, which can’t keep anything in cache because of it’s lack of RAM. Maybe it’d be better on the smaller screen, but looking forward to the 2GB upgrade on the 6s. The previous iPod only had 512MB, and it was slow and glitchy. Thank god Apple has updated it with 1GB. I have both the iPhone 6 and the iPod touch 5, and i think 1GB is fine, no need for 2GB. More Memory also uses up more battery. I’ve never wanted an iPod touch. But this is the first one that I would consider IF I didnt have an iPhone. It looks pretty good, but just dont need it. It needs cellular capability to be really useful to me. Im never at home and dont have wifi at work. If it has cellular then it IS an iPhone. The iPod touch is an iPhone for people who don’t want cellular. Much as I wish that were true, I don’t think it is, sadly–not while Wi-Fi isn’t ubiquitous, anyway. It’s an entertainment device. It has no GPS or Touch ID either. But it was worth buying, so I did. Nice one, Apple. I’ve always liked the iPod Touch, and I’m very happy to see it upgraded. Home run! Apple finally gave the IPT the upgrade it deserves! It’s nice to see it back and with near iPhone functionality — how about an article rounding up all the pundits and other articles that claimed the Apple was dropping the iPod, and particularly the IPT, entirely. Can the iPod touch be free to buy and the shipping be free as well because we really want the phones and we don’t have to keep waiting. Send the phones in on the next today instead of the next 5-10 days. Oh yes Chastity, Just ask your parents for a free iPod touch.